WASHINGTON (CNN) -- The pilot of a doomed plane that crashed, killing 50 people, said "Jesus Christ" and "We're down," seconds before the plane hurtled from the night sky into a house outside Buffalo, New York, in February. 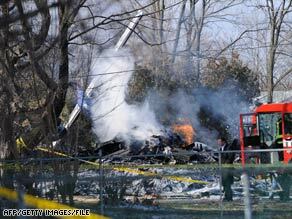 An investigator walks past the wreckage from a plane crash in Clarence Center, New York, in February. The last sounds heard in the cockpit were First Officer Rebecca Shaw saying "We're" and then screaming at 10:16 p.m. on February 12, according to a transcript of the cockpit recording. Seconds earlier, the pilot, Capt. Marvin Renslow, said, "Jesus Christ," as a sound "similar to stick shaker" was heard, the transcript said. Renslow said, "We're down," and a thump was heard before Shaw said, "We're" and screamed. Continental Connection Flight 3407, operated by regional carrier Colgan Air, plunged into a house in Clarence Center, New York, killing all 49 people on board and one man in the house. About five minutes before the crash, Shaw had shared with Renslow her fear of flying in icy conditions, according to the transcript. "I don't want to have to experience that and make those kinds of calls. You know I'dve freaked out. I'dve [sic] had like seen this much ice and thought, 'oh my gosh, we were going to crash," Shaw told Renslow. In a story Monday, the Wall Street Journal cited investigators as saying the crash resulted from pilot Marvin Renslow's incorrect response to the plane's precarious drop in speed: He overrode an emergency system known as a "stick pusher," which sends the plane into a dive so it can regain speed and avoid a stall. Colgan Air, the operator of Continental Connection flights, said Monday that Renslow had never trained in a flight simulator with the safety system that activated just before the plane went down. Colgan said there is no regulatory requirement that it provide hands-on training with the "stick pusher." "A stick pusher demonstrated in an aircraft simulator is not required by the FAA," the airline said in a statement. "And thus was not included in Colgan's Q400 training program." The Federal Aviation Administration said its standards do not require hands-on practice with the safety system. "That's a significant problem," veteran pilot Douglas Moss told CNN. Moss, an expert in stall recovery, believes flight simulator practice with a stick pusher should be mandatory for aspiring pilots. "It's similar to picking up and throwing a groundball in baseball. You can study it academically all you want to but you really need to develop the proficiency, the skill, the muscle memory required to do that," said Moss. Renslow had failed five pilot tests, known as "check rides," three of which occurred before he joined the airline, Colgan Air said. Renslow had revealed only one of those failures to the airline, according to Colgan. NTSB Chairman Mark Rosenker said Tuesday that the board's hearing will not address who is to blame for the accident. "Over the course of this hearing, we will continue to collect information that will assist the safety board in its examination of safety issues arising from this accident," he said. He said those issues are: airplane performance, cold weather operations, a sterile cockpit, flight crew training and performance, and fatigue management. All About Accidents and Disasters • U.S. National Transportation Safety Board • Colgan Air Inc.